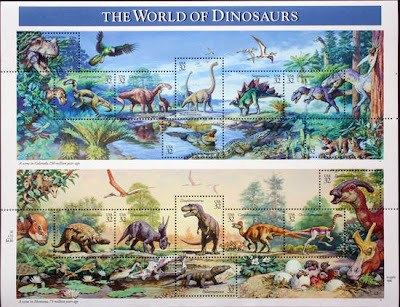 When I was asked to design the World of Dinosaurs stamp issue (1996), I painted two panoramic settings for the individual stamp subjects. The top one was Jurassic and the other was Cretaceous. I keyed the colors differently to separate them. I developed the design in a charcoal comprehensive drawing that I showed to the various paleontological consultants for their input and approval. It was vitally important that the dinosaurs, insects, and plants in each panorama were all known from the same geologic formations and so would have lived together in the same time and place. Having worked out the plan in charcoal (bottom), I felt a lot more confident when I went to the final oil painting (top). In most natural science illustration, it's essential to present the art in a comprehensive, intermediate step that is sent out for approval by the scientists. This was probably the only final stamp artwork that was ever worked on en plein air. I had to go outside in the forest to paint the ferns, because I discovered that cut ferns wilt too fast. The painting was less than 24 inches wide and painted on flexible Bristol board so that it could fit on the drum scanners of the time. 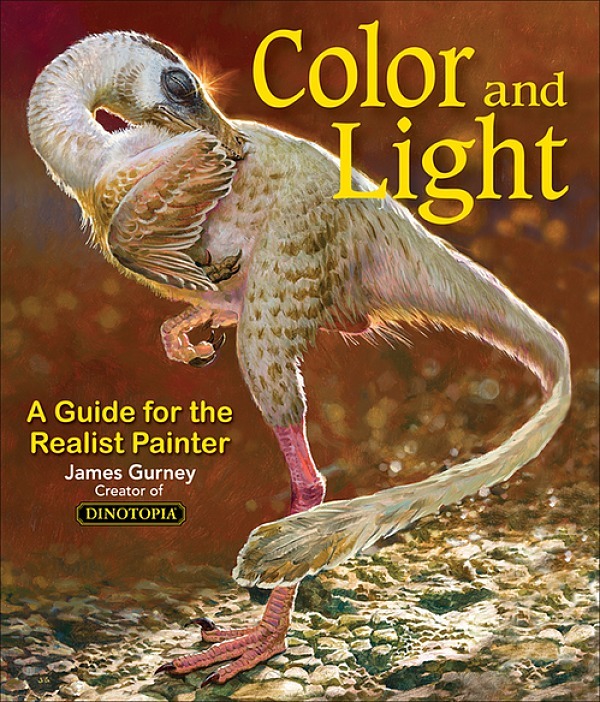 For for a detailed, behind-the-scenes look at how I do paleoart, check out my new DVD "How I Paint Dinosaurs" from Kunaki.com. 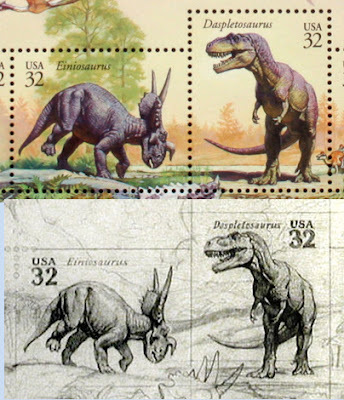 I had those stamps, and thought they were the coolest ever. Unfortunately they were used for what they were intended for, the mail. Wish I kept a set intact. I bet stamp collectors love them. Hey James, what type or brand charcoal pencil did you use for the drawing? What do you use now? Joel, yes, that was the idea, to sell stamps that no one ever used. It made such commemorative sets quite profitable for the USPS. ERC, when I was an art student I got my hands on a couple big boxes of General's charcoals, Medium and Soft, and I'm still trying to use them up. This is my favorite set of stamps ever. I re-did my office but I still had to hang them up because I love them so much and admire their individual compositions as well as their WHOLE composition so much - Here's a pic of them hanging - Thanks so much for the fun information on them, Jim! That's awesome. Thanks for sharing the photo, Robb. I recognize the Ceratosaurus in the top panorama. It's on a mousepad I have! I bought the autographed stamps in a custom mat from the Post Office's catalog at time of their release - it's one of my prized possessions! What a coincidence, I've just received that stamp set in the mail last week for my collection! I still have the set I bought! 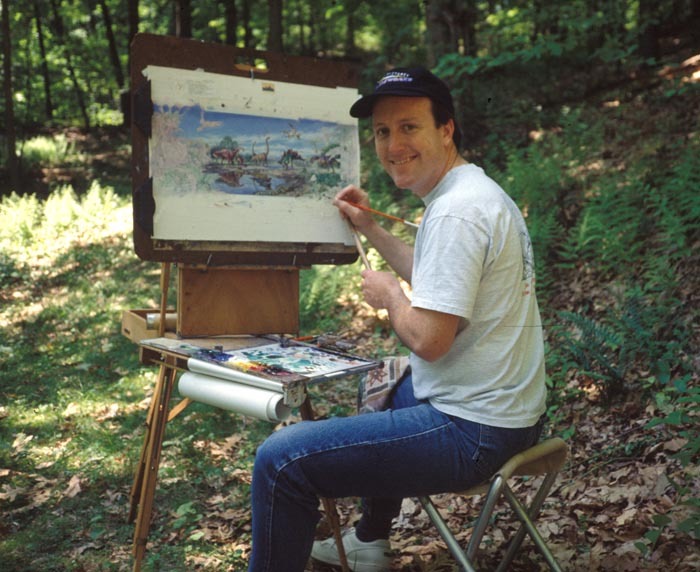 Who's that young guy at the easel? Great stuff, James. Thanks for posting! 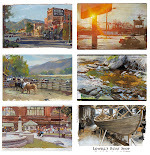 I just finished watching your painting video and I have 2 quick questions? Do you prime your illustration board with gesso before you draw or is the matte medium enough to prevent absorption? Also, how do you prevent warping? No I don't prime the board first. I like the way the illustration board takes the pencil. It doesn't warp because I'm using a heavyweight board. If you do get warping, do the same thing to the back that you do to the front, or even just wet the back (don't do an 'X' as some people recommend because that makes a different kind of warping). Thanks. I'll definitely try your method on my next painting. If I ever get back to charcoal drawing I use the Generals also. During the 90s when i use to take classes everybody used the RITMO charcoal pencils. They were smooth, silky and easy to erase. I think towards the end of the decade they changed ownership and the quality wasn't the same imo. If theres anyone out there who can make charcoal just as smooth please do. 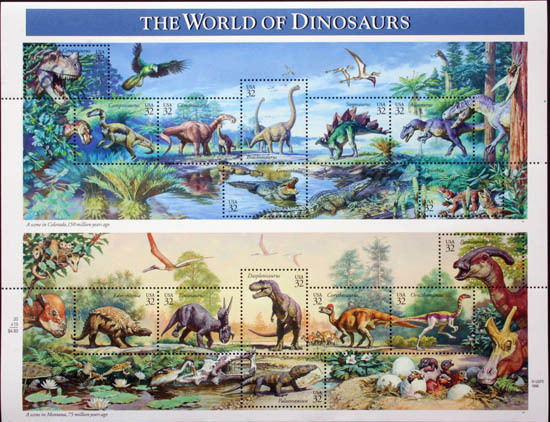 Jim - Have you seen that "First Day Cover" stamp of the brachiosaur before? And did you also design that? Very cool looking, either way - Thanks again for this great post!